Posted on June 25, 2008 by D.C.
Last week, LAPTOP magazine published a review of the new 10-inch Intel Atom-powered ASUS Eee PC 1000H. The Eee PC 1000H offers the option of a mechanical hard drive (80GB in this case). 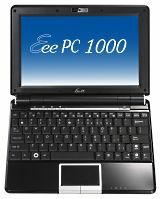 The Eee PC 1000H reviewed had only 1GB of memory (you can go up to 2GB), and was priced at $649. As they point out, this is the largest netbook or sub-notebook to come out so far (it’s even slightly larger and heavier than the 10-inch version of the MSI Wind). hardware switches for its “Super Hybrid Engine” which allows you to change the speed and power-saving mode of the device – from 1.2GHz up through 1.8GHz. With the 6-cell battery, they were able to hit around four and a half hours of battery life, and overall they liked it, giving it 4 out of 5 stars (with the main drawback being price – $150 more than the MSI Wind). This entry was posted in ASUS, Intel Atom, Netbook, Reviews, Reviews - Video. Bookmark the permalink.